Round and around and around… these socks are getting boring. Fortunately, I’m just about to hit the calf increases, at which point I will a) have no idea what I’m doing, and b) be making things up as I go along, so that should liven things up a bit. 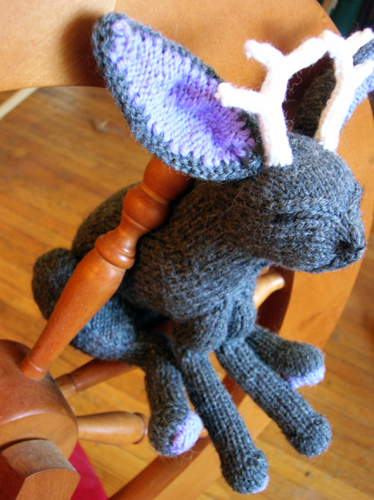 Or I could just let Oolong knit for a while. That would also probably make things more interesting. 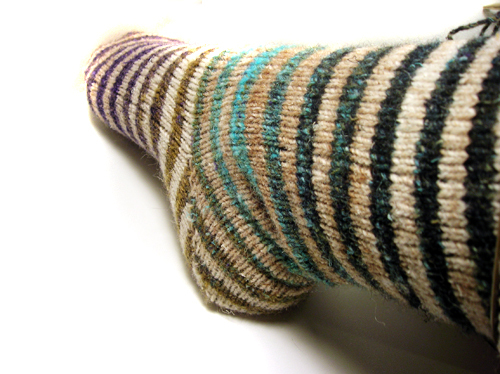 I had to frog the sock foot, not only due to the seam placement issue but also because my stripes were three rounds high—which is fine when one is working in rounds, but when worked flat it makes it impossible to work the stripes without cutting the yarn after each one. Sometimes it really does help to put more than a moment’s thought into a project before casting on. Really. 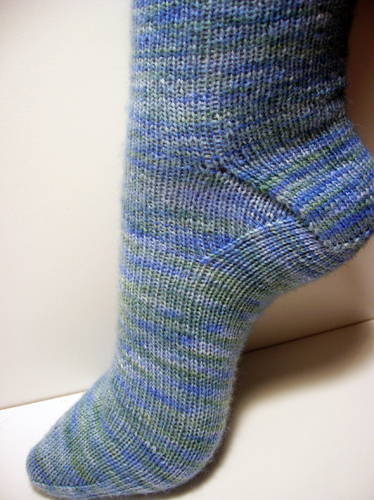 So, a-frogging I went, and then re-cast on, same toe style and stitch count as before, but with the color-change seam on the right side of the foot, and each stripe four rounds high. 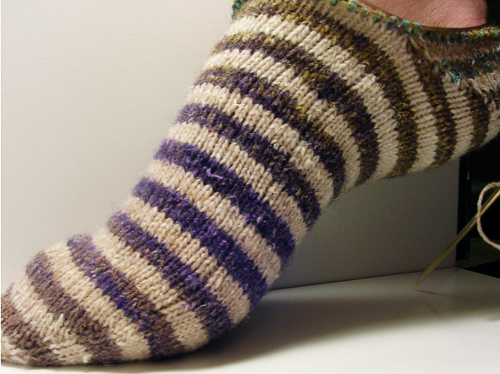 This version seems to work just fine, although it took me several attempts to get the heel the way I wanted. And we will not talk about how the foot is a little snug—possibly too short. I am not frogging back again. It’ll end up a little bigger after I block it anyway, right? Right?! 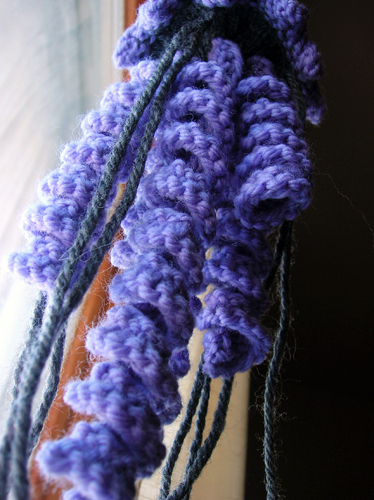 Busy weekends don’t leave much time for knitting (or blogging! 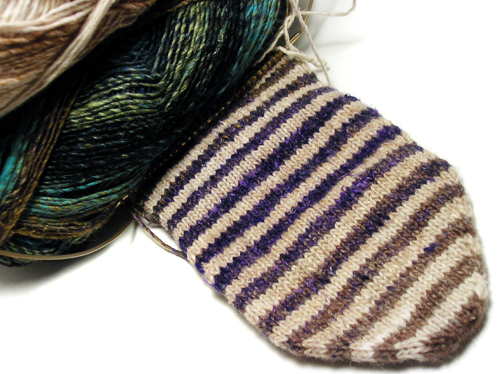 ), but I did get in a start on a wonderfully stripey sock. The yarn (Noro Silk Garden Sock) is just as ridiculously thick-thin and VM filled as I was warned it would be, but I’m kind of liking the fabric it’s working up into—soft, but with a definite woolly feel. These should wear well, which is good, because I anticipate wanting to wear them all the time. I may have miscalculated a bit, though; I hid the color change seam at the underside of the foot, but it turns out it’s not particularly visible anyway, and it may make the heel turn tricky. Hopefully I can work something out. We’ll see. I knit decently fast. Not like, world’s fastest knitter, faster than the eye can see fast. But I can whip through a single round of a stockinette sock in a minute, if I’ve got a non-splitty yarn and good needles and luck on my side. Fairly fast. But I also knit a lot. While most people are at work or out to lunch (or just out to lunch, if you know what I mean), I am knitting. I’d guess that if I’m truly enjoying a pattern and working hard on getting it finished, I probably knit 8-9 hours a day. 8-9 hours a day times one stitch every few seconds is a lot of stitches. 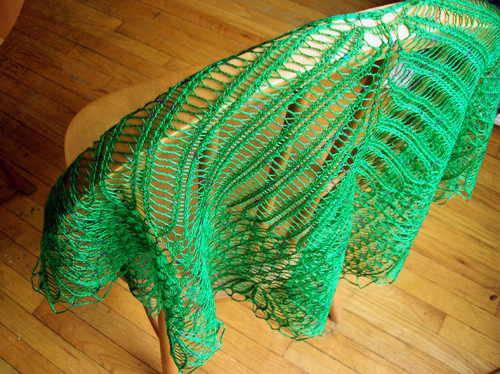 A lot of stitches and a really quickly completed shawl. Notes: I did overdye the yarn, as planned, and the difference is subtle, but there—the green is slightly more subdued and less pastel, while the pink confetti bits have turned a bit purple, and blend much better. Other than a slightly smaller needle size, I made absolutely no modifications to the pattern. 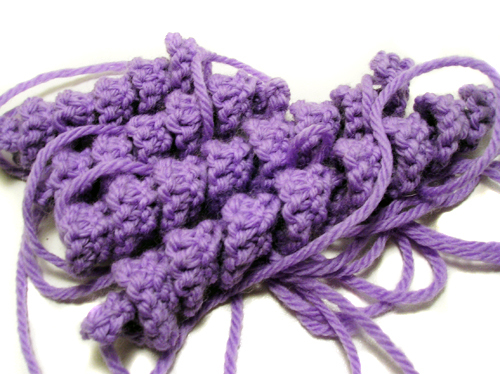 Really, truly, a delight to knit. I want to knit ten more. 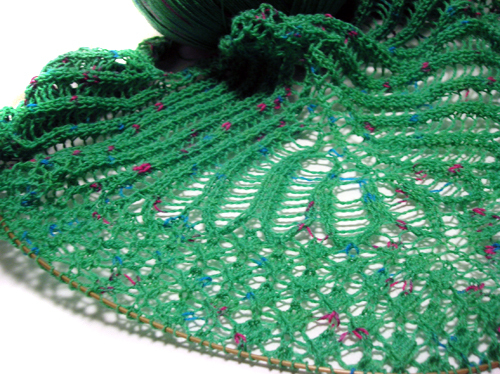 On a bit of a whim yesterday I decided to cast on for some lace. Because obviously what I need in my life is more WIPs, right? 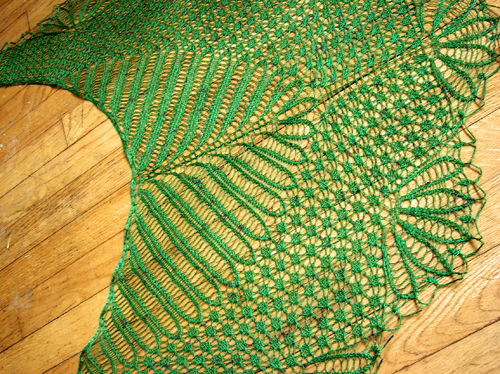 But I think this one will be an FO by tomorrow, so I’m not too concerned. I’m really not sure why someone thought it would be a brilliant idea to ruin a perfectly good green cashmere laceweight with random confetti-esque splotches of pink and blue. I thought I could ignore it, or that they would just kind of disappear into the fabric, but I really can’t get over it. Hopefully an overdye once it’s finished will smooth them out a bit. Did I mention how totally, truly awesome it is to have my knitting mojo back? Oh yes. I am a knitting machine. I don’t really have much to say about this other than it was super fast and (comparatively) easy. 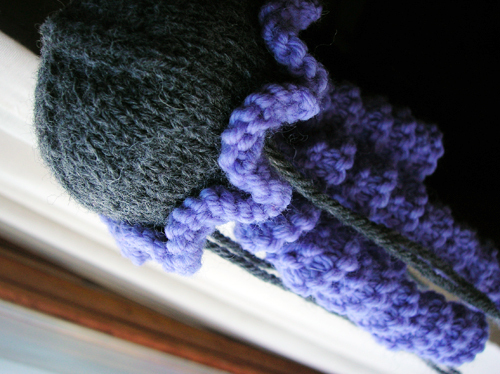 I knit all six tentacles in about two and a half hours, completed the body in another three, and the seaming, stuffing, and finishing took forty-five minutes or so. This is definitely a pattern I’ll be making more of. One note if you’re planning to make this for yourself, though—beware the bind-off instructions for the ruffle on the bell. It calls for a “k2tog tbl, put stitch back on left needle, repeat” bind off, which is way, way too snug to get the nice full ruffle that’s shown on the pattern itself. The rav projects page shows a bunch of poor, unruffly bells, and I suspect this is why. I used a sewn bind off, which worked out much better. I also have notes on how to pick up stitches from the wrong side of a piece, but those will come next week along with a few other neat tutorials. 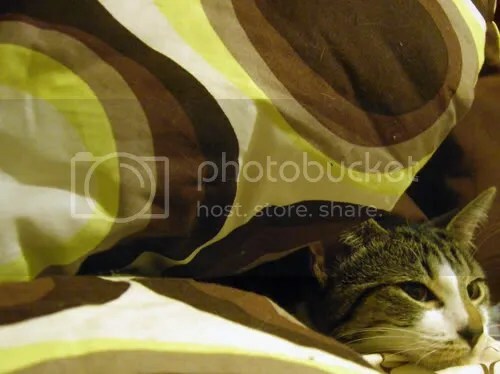 PS: it’s Caturday! Oolong says hello. I’ve been working all week on a post about an interesting cast-on that I’ve been developing, and was going to post it yesterday only to discover… the cat has made off with my swatches. And I still can’t find ’em. I am determined to get new ones knitted, but I’ve got other stuff to work on, too, so it’s not happening as quickly as I would like. If any of you can persuade Oolong to hand over the swatches, I would be most grateful. Jackalope (n): a fictional animal and a cross between a jackrabbit and an antelope, goat, or deer, and is usually portrayed as a rabbit with antlers. 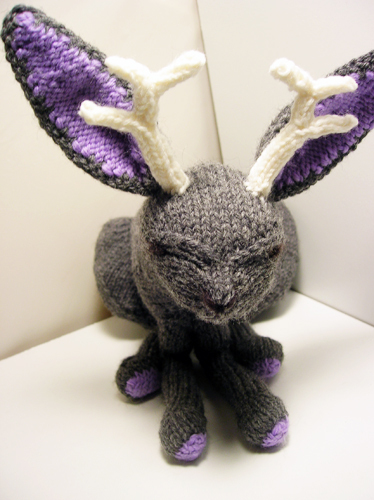 Jeshalope (n): a jackalope made by Jesh. Knitting this pattern was like some kind of ultimate test of a bunch of my knitting skills; short rowing, increasing, pattern reading, grafting, picking up endless numbers of stitches. Fortunately, I like doing all of these things, so it was an enjoyable challenge. 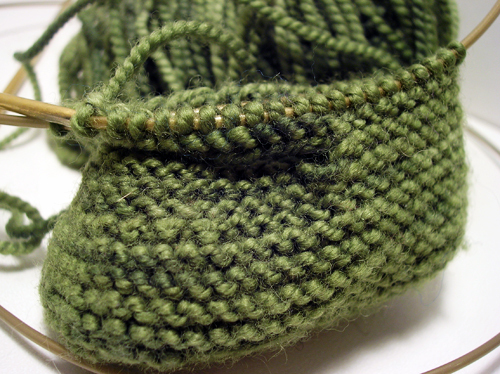 On short rows: I think the only part of the Jeshalope not shaped by short rows is the antlers. That’s it. Everything else—from the tail to the ears—has endless numbers of wraps and turns. Some Ravelers even recommended using nothing but the sharpest needles due to the fiddliness of it, but I managed okay on my Addi Turbos. Still, this wasn’t the kind of thing where I could glance at the pattern to get the gist of it, and then just go off on my own; I had to follow the instructions very carefully, to the point where I copied most of the directions into a desktop sticky note, and deleted them line by line as I worked through. This made it much easier to know where I was at all times, and it was very gratifying to watch the number of lines slowly dwindle as there was less and less to get done. The one thing that did help a lot with the short rowing is that I knit backwards on all wrong side rows, rather than purling. Because I hate purling. But it also made it much easier to both see and pick up the wrapped stitches when I was always looking at the right side of the fabric. On grafting: I love grafting. I really, really do. I wouldn’t recommend this pattern for anyone who doesn’t, or anyone who won’t even consider learning to love grafting. But honestly, it’s one of the most amazing things. To be able to take two different pieces of fabric and join them together seamlessly is nothing less than magic. And there’s a lot of magic in here. Each of the arms and legs are grafted along the bottom, as is the entire underside/belly, which creates a nice tidy seam along the bottom, and looks even better than it probably would have if the entire thing were knit in the round. 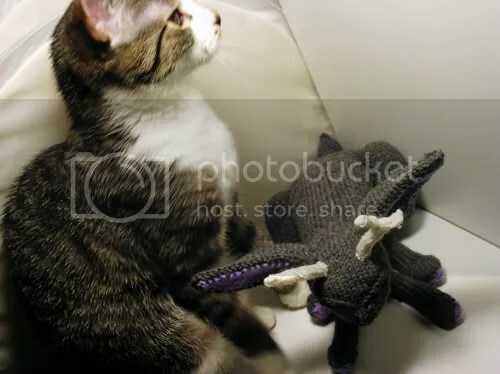 I think after this I could get into toy knitting in a big way. 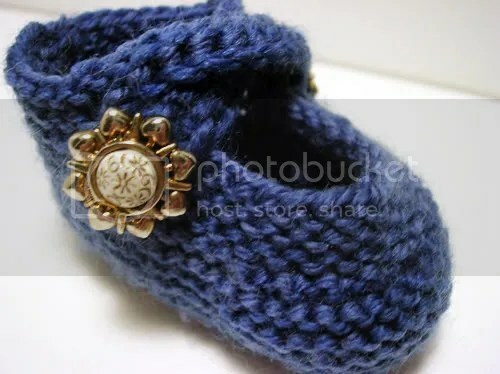 As previously mentioned, my sister-in-law is pregnant and due in June, which makes the next six months a perfect opportunity for baby knitting. I love baby knitting! 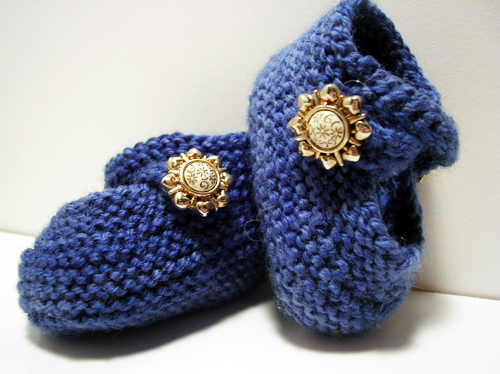 Projects can be churned out ultra-fast, yarn scraps can be used up, and let’s face it, everything’s cuter in miniature. However, due to the fact that the stitches for each strap are not cast on at the same time, this leaves the right strap one row shorter than the left strap. So, I bound off the first twenty stitches knitwise, then continued purling across the last twenty stitches, before creating the button loop on the right strap and then binding off the last twenty stitches purlwise. 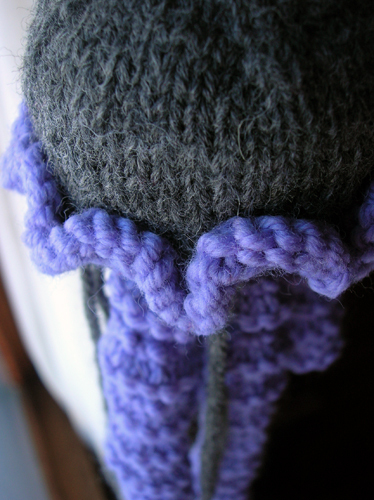 This leaves your yarn at the back center of the bootie, where it is much easier to sew in the end than it would be at the end of a very thin strap. does end, actually, although I never would have guessed while I was knitting it. Relatively speaking, it didn’t take too long to complete, but in the foot I got sucked into that black hole of knitting where you keep going around and around and around and around and it never ever gets any longer. Now I get to block the poor thing (it really needs it, after being knitted so hastily and tried on so many times) and knit its mate. with varying levels of success. These all need to be filed and polished still, but I think they’ll work. I know that several spindle makers who hand-bend their hooks tend to use sterling silver or gold filled wire, but I won’t, for two reasons: one, I think sterling silver spindle hooks is about on par with sterling silver stitch markers, in that it is completely unnecessary to use such a high end and expensive metal for something that’s probably going to take some serious beating. Two, half hard or full hard sterling silver wire is pricey—more than this lowly spindle maker could afford. 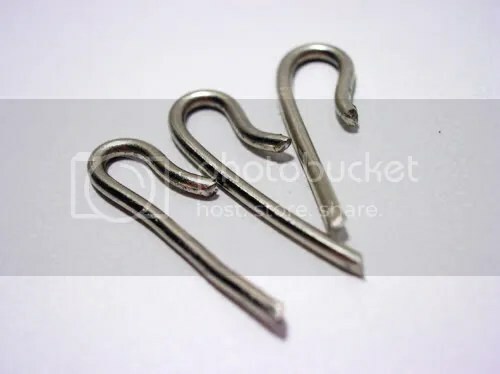 Instead, I opted for half hard nickel silver wire, which is strong, tarnish-resistant, and much less expensive, so I don’t have to drive up the price of my spindles to use it. Also? Nickel silver is sometimes called ‘alpaca.’ I’m not kidding. Obviously it was meant to be. 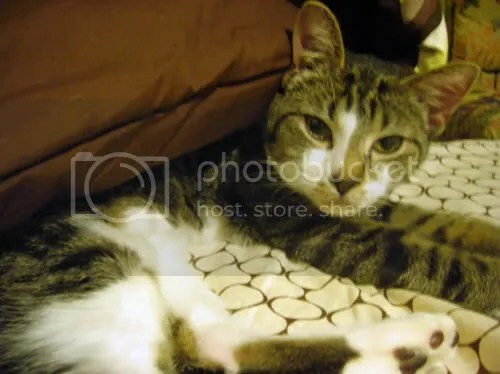 As for Oolong, well… her new favorite thing is to wriggle under my comforter while I’m in bed and go to war with my feet. 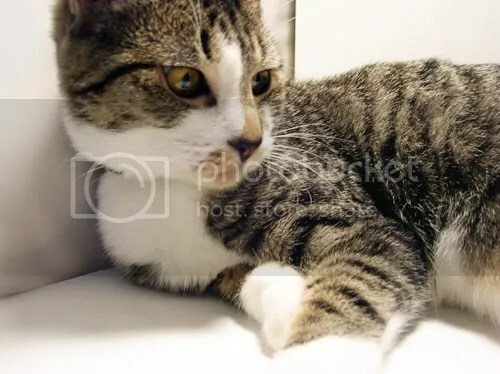 which is adorable when I am awake and reading or somesuch, and can attack her in return, less adorable when I’m trying to sleep and all of a sudden there is a vssshvssshvsssh noise followed by claws in my foot. But then I wake up and see that little face and I can’t be mad at her at all. Stupid cat.